Excellent article on how to pick a bike for commuting or going to places using a bike. Commuting by bike: Finding your new two-wheeled best friend. Over the last few years I have had many of my friends ask me how they should go about choosing the bike that would work for them, and while choosing a frame style will ultimately depend your individual personality and preferences this overview can at least give anyone a basic outline and a decent place to start if you find yourself wanting to get out of the car and merge into the bike lane. Figuring out which kind of frame is ideal for you can be a daunting task, and the only accurate way to find out what works is to go to your local bike shop and try as many different models as you can. Are you someone who enjoys the upright riding that is offered with mountain bikes and many commuter-specific hybrids? Maybe you’re the type that enjoys being streamlined with your top tube and flying down the road with just a jersey on your back. In any case the following breakdown is meant to give you a simple overview of the spectrum that exists within the framed world. Find a frame that suits both you and your goals. Remember that this is the most important statement you should have an answer for when looking into bikes since it will heavily influence what style of frame and materials your bike will be made out of. I myself could argue that the bike styles no longer fit on a linear line, but to keep things simple I’m outlining the three most-common bike styles that I see on the road. The road bike is named after what it is designed for: riding on smooth, paved surfaces found on streets and different paved bike trails. Common features of this style are narrow bike tires, a lightweight frame, and a decent range of gears to choose from when climbing hills or speeding through downtown. Given a set of curved handlebars you have the option of riding more upright or in a position leaning towards the fork. While dropping in is optimal for transferring power from your legs into the bike and works wonderfully on a stretch of open road, being upright will allow you to gauge your surroundings a little easier if you’re making frequent stops. Much like cars, road bikes have their subtypes that have been modified for long-distance riding with heavy loads, those made for speed and handling, and several that fall in-between. Opposite of the road bike, mountain bikes are designed to handle and withstand unpaved surfaces and rugged terrains. Depending on the demand, mountain bikes may come equipped with either front, rear, or a combination of suspension systems. Almost every one of my friends (including myself) learned how to ride on mountain-style frame. They have wider, deep-treaded tires, low center of gravity, and provide an upright position for the rider that is ideal for uneven terrains and quick adjustments. The gears found on these bikes vary greatly based on the trails they were meant to tackle, and the geometry of each mountain bike will typically give away what type of climbing they were made for. As a simple rule of thumb, imagine the frames triangle as an arrow indicating the level of incline it is capable of taking on. The best way to think about the all-encompassing world of hybrid bikes is that each falls on the spectrum that lies between what you come to define as a true road bike and a true mountain bike. On the one end you have hybrids that are designed primarily for road riding but have some components that allow them to venture onto dirt or light-graveled trails. The other end you have hybrids that will go through a stream and also provide some riding comfort on a longer paved trail. Hybrids are becoming more and more popular with beginning commuter cyclists since they offer the ability to carry loads, are designed with the lightweight components and frames found in road bikes, have an upright riding position, and easily ignore defects in the road much like a mountain bike. The tires will also fall somewhere in-between road and mountain bikes depending on the usage it is designed for. While the above listed have been advancements of the diamond frame from the original safety bicycle, there are also many other types of bike frames that exist in the world (including recumbent, tricycles, electric assist hybrids, and the now popular folding bikes). Keep in mind that your ideal bike may just fall into one of these awesome categories. Folding bikes are huge in the transit-commuter population right now. The overall feel of the ride will depend on your frames material, and since this is just a primer I will briefly go into three popular materials: steel, aluminum, and carbon fiber. Steel – Frames that are massed produced will almost always have a smaller price tag associated with them, and while they have the highest mass out of this group the metal will provide some vibrational absorption in the rough spots encountered during the ride. Additionally, if you are looking to get a bike custom built to your leg and torso sizes you really cannot complain about the price-point. Aluminum – A very popular and lightweight metal that is use in mid to higher-end frames. While having approximately 1/3rd the density of steel it’s a very common practice to see frames with a thicker tube to prevent frame failures. The one real tradeoff you’ll see here is that these bikes tends to be more rigid which results in those small rocks and rough spots on the road jostling you, the rider, a bit more. Much of this rigidness can be easily offset by switching the front fork to an alternative material, which is what you see in many of the elite bikes used in major competitions. Custom builds for aluminum bikes will range from just under 1000 to well over 3000. Carbon fiber – While many people view this as the end-all material to use in a debate, there are still many professional and elite cyclists who stay away from these frames. While carbon fiber will give you the best weight, stiffness, and durability overall, the prices for a properly built frame will not come without your wallet waking up with a hangover. The noticeable differences that I’ve felt with my own bike is that the low-vibrations you typically feel from the tires humming along the road is gone. Small imperfections or gravel in the road is masked, but as soon as you encounter an area that has a few asphalt bumps or a slightly recesses manhole cover, get ready because you are going to feel it in your bones. Now because the condition of most inner city roads is not perfect rough spots are expected during a commute, and due to carbon fibers brittle nature I personally do not recommend loading up one of these frames with your working gear and blazing through downtown, as doing so could possible make short use of a rather expensive investment. If you are looking to get into some serious competitive cycling they do make fantastic road and touring bikes. What sizes should you be looking for? Getting proper measurements to find out what size bike will fit you is essential if you’re in this for the long haul. Much like a good pair of jeans you need to start out by sizing up and then finding what brand fits you best. To take the analogy even further, most people could wear their favorite pair of jeans every day and not complain, so why would you expect anything different in your bike? The general rule of thumb is that the standover measurement of your bike should be 1-inch lower than your leg length. Take shoes off, stand with back against wall. Mark where the top of the spine is against the wall using a pencil. Measure from the floor to the mark. Record measurement in both inches and centimeters. 3. Go here, pick the type of bike you want to be measured into, enter data, and boom! You have a good estimate of the size that will work for you. Where is the bike zoo or an adoption center? Alright so you’ve sized yourself up, have some basic knowledge, and have the urge to go through with this. While the ease and appeal of stopping by a big-box store and riding down the isles may be there, you wont be able to take it for a true test spin around the block without the local police on your tail. Recreational equipment outlets (ex. REI) will have a decent selection and a knowledgeable staff, however I highly recommend taking the time to go to your local bike shop and have a conversation with the professionals. If you’re lucky enough to have a place like Flying Pigeon Bicycles on your block you’ll be set for everything from custom builds to repairs. You might even acquire a riding buddy for the morning commute! Whichever avenue you decide to go down make sure you try out anything and everything that appeals to you. Give the bike at least a mile, feel how it handles under fast and slow speeds, then ask do a little soul searching to see if it really fits you. Don’t have a soul or believe in souls? Then just use your brain. The bike that you want is really expensive… so how can you make the price tag more affordable? This is where going to a local bike shop will pay off. Unlike the big-box and recreational stores, if you find a frame that you love but do not require racing components or ceramic disk brakes start talking with the shop guys/gals and ask them what they’ll swap out to reduce the price! You could also utilize your bargaining skills to see if they’ll come down on the price or throw in some extra’s. Still try and find out what kind of frame/style/size you like the most by utilizing the methods above, but go to a site such as BikesDirect or hunt on Craigslist to save some big money. If you do decide to go this route however, I encourage you to never forget the help that the local shop gave you. These people work and live on bikes, keep them in mind if you ever need accessories, tuneups, or have questions about riding. Additionally if you live around a college town and want to get into biking at the start of summer its worth talking to students to see what they’re going to be doing with their bikes at the end of the semester. 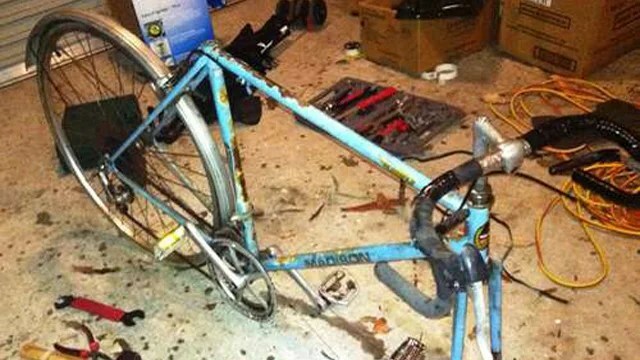 Check out this older post: Restore a discarded bicycle. Never forget your local bike shop. What else should you plan on purchasing once you find your bike? The most important thing to remember when deciding if a bike is going to work for you is to repeatedly revisit what your goals are. Many of us are not aiming to qualify for the next Tour de France, so a basic bike with fewer bells and whistles will probably suffice. 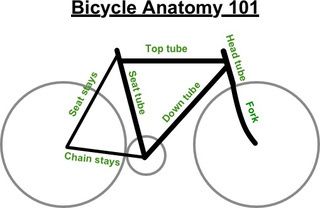 It also doesn’t hurt to really learn how to take care of your bike and handle the most common bike failures: flats, cables, chains, and seat replacements. Overall I believe that commuting by bike is something that is going to continue to become more and more popular within the next several years. 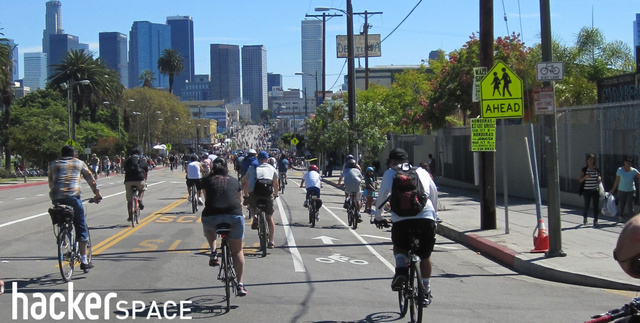 I find that even in Los Angeles where we are still heavy into car culture it is perfectly safe to travel to and from your destinations as long as you stay aware of your surroundings and obey the rules of the road (you are a vehicle and need to act as one). If you are wondering how to handle traffic while on a bike my previous post covers the majority of intersections and maneuvers that one will encounter while biking through the city. Posted in UncategorizedTagged bike commuteBookmark the permalink.